AI. Blockchain. VR. These are just a few of the latest technological advancements around the world. Technology, whether you like it or not, is improving our lives. Without it, just imagine how our lives would be. And the thing that amazes me with technology is that there are always new mobile apps that help make our lives easier. I’m always on the look for new mobile apps that are changing the way things are done and that help improve the society, especially locally developed apps that are targeted at making the lives of Filipinos better. This is a fairly new app that is practically ‘Waze’ for getting a massage. Book a massage from your phone, track the location of the therapist, input a tip, pay via debit/credit card, save your location for future reference and more! It’s Zennya – YOUR spa on demand. It is a bit more pricey compared to the typical massage at your favorite parlor, but their main feature makes them more convenient—they come to you. Zennya is available on iOS and Android—download and try it today! Have you ever wished for a single app that had all your favorite restaurants on ‘stand-by’—where you can order your favorite dish, anytime, anywhere? Well, with Kanguru, you have all your favorites a hop away. This app is pretty cool because it provides the basics: search for the faves, place order, chose a payment method, and track your order. Kanguru makes ‘being hungry’ a past thought. The User Design could be better, but if it gets me my food, I don’t really care about the design. Satisfy your cravings today by downloading Kanguru on iOS and Android. 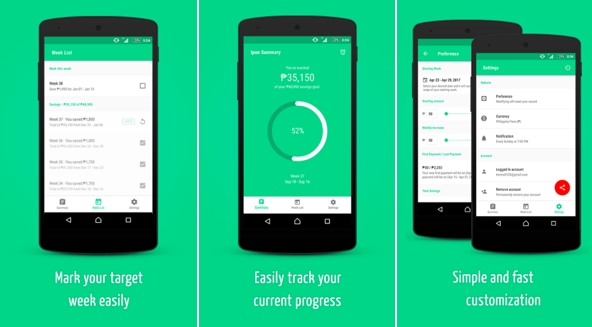 Start saving today by downloading the app on Android! I recently discovered this new locally developed app – Kumu. It currently allows free video calls and messaging. Although, I’ve heard that they’ll be releasing some awesome features and updates this year. I personally love how it makes video calls super clear and, of course, the awesome localized stickers. I am hoping they spend some more time on fixing some of the UserExperience, but overall it’s a pretty good app, considering it’s still in Beta. Try it out for yourself by downloading the app from the Apple Store and Google Play. So there you have it, four local mobile apps that are fairly new and have a real purpose—from messaging and video calls, to saving money on a weekly basis. I personally love the food apps though because it makes ordering and satisfying hunger A LOT EASIER. Imagine how technology has improved our lives. Before, we would just tell ourselves “I’m craving a really, really yummy burger” but you have to fit it into your schedule to go out, wait for a table, order, and then enjoy. Now, all you have to do is bring out your phone, place your order, and wait! The same goes for a massage! Discovered any new, locally developed, and helpful apps? Tell us about them in the comments!